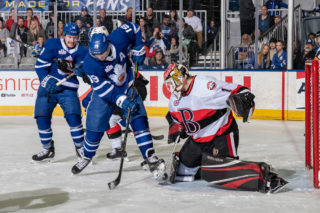 The Toronto Marlies stormed back from an early deficit on Saturday to down the Wilkes-Barre/Scranton Penguins 7-4 and extend their point streak to five games. The Penguins scored a pair of goals in the first three and a half minutes but then found themselves in some penalty trouble. And the Marlies took advantage. On a two-man advantage, Chris Mueller halved the deficit as he redirected a cross-crease pass from Jeremy Bracco at the 5:50 mark. Dmytro Timashov had the secondary assist. After the Penguins took another penalty, the Marlies were back on the two-man advantage and Trevor Moore connected on a one-timer in the high slot to tie the game just a minute later. Bracco and Timashov again had the assists. Just 25 seconds after that, Pierre Engvall put the Marlies in front with yet another goal on the power play with assists to Josh Jooris and Mason Marchment. After the frantic first period ended with the Marlies leading 3-2, the second cooled down a bit. Midway through the middle frame, Jeremy Bracco scored to double the lead with Mueller and Rasmus Sandin picking up helpers. 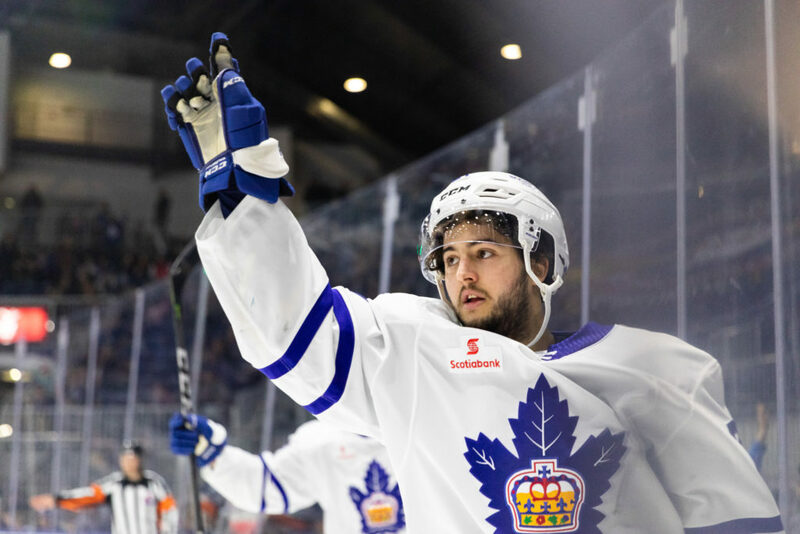 Jooris scored 16 seconds into the third as the Marlies began to pull away and then Bracco netted his second of the night before the midway point of the final frame. The Penguins were determined to put up a fight, however, and scored a pair of goals from Ethan Prow and Linus Olund before Morgan Klimchuk found the empty net to score his first as a Marlie and seal the 7-4 victory. Between the pipes, Kasimir Kaskisuo stopped 36 shots for the victory while Anthony Peters had 24 saves at the other end. 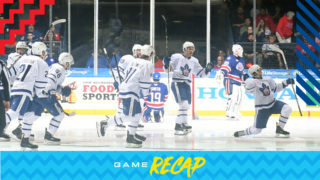 The win was the Marlies second straight and gives them points in five straight games, four of which were victories. They get right back at it Sunday against another Pennsylvania foe, the Lehigh Valley Phantoms. Chris Mueller scored at 5:50 of the first period on the power play. He later added the primary assist on Bracco’s second period goal, the lone assist on his third period goal and the secondary assist on Klimchuk’s empty net goal. This is Mueller’s first four-point game as a Marlie. Mueller leads in the Marlies in points (21) thorough 18 games. Trevor Moore scored at 6:56 on the power play in the first period. This was Moore’s second power play goal of the season. He has recorded 16 points (11 goals, 5 assists) through 17 games. Pierre Engvall scored his first power play goal of the season at 7:21 of the first period. Engvall has 12 points (6 goals, 6 assists) through 18 games this season. Jeremy Bracco scored at 10:26 of the second period and earlier added the primary assists on Mueller and Moore’s power play goals in the first period. This is Bracco’s first four-point night of his career. Josh Jooris scored shorthanded 16 seconds into the third period and earlier had the primary assist on Engvall’s first period power play goal. Jooris has six points (4 goals, 2 assists) through 20 games this season. Morgan Klimchuk recorded his first goal as a Marlie with an empty net goal at 19:14 of the third period. Klimchuk has nine points (4 goals, 5 assists) in 18 games with Toronto and the Stockton Heat. Dmytro Timashov recorded the secondary assists on Mueller and Moore’s first period power play goals. Timashov has eight assists on the power play. Mason Marchment registered the secondary assist on Engvalls first period power play goal. Marchment has seven points (5 goals, 2 assists) in five games. Rasmus Sandin had the secondary assist on Bracco’s second period goal. Sandin has seven points (4 goals, 3 assists) in 11 games this season. Calle Rosen recorded the primary assist on Jooris’ shorthanded third period goal. Rosen leads the Marlies in assists (16). Rosen has 10 points (1 goal, 9 assists) in his last 10 games. Colin Greening registered the secondary assist on Jooris’ shorthanded third period goal and the primary assist on Klimchuk’s empty net goal. Kasimir Kaskisuo stopped 36 of 40 shots he faced. Kaskisuo is now 2-3-0-0 on the season with a .878 Save Percentage and a 4.39 Goals Against Average. The Marlies first three goals of the game were all scored within 91 seconds of each other. 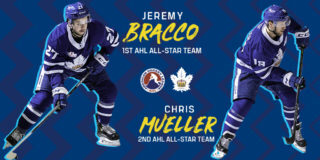 Two Marlies recorded four point nights – Jeremy Bracco (2 goals, 2 assists) and Chris Mueller (1 goal, 3 assists). Toronto went 3-for-4 on the penalty kill and 3-for-4 on the power play. This is a season-high for power play goals (3) in one game. W-B/Scranton had a 40-30 edge in shots in all situations. Calle Rosen led the Marlies with five shots on goal. 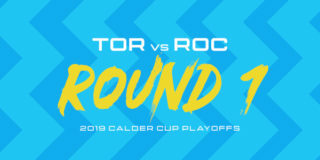 The Marlies are 2-0-0-0 against Atlantic Division opponents and are 1-0-0-0 against the W-B/Scranton Penguins this season. Obviously, I felt we needed to get a bit of a wakeup call. We weren’t ready to play from the drop of the puck and that’s on me. I was giving myself an opportunity to fix it and the guys responded. We had a lot of different people contributing and I thought we had a great response as I said coming out of that time out, the power play, playing with the level of urgency that it did. I think that combined with the rest of that first period and a good chunk of the second, I thought we just played at a level we haven’t played at all season long, so a credit to Wilkes because they drew that out of us but it was really good to see our guys have that level of a response and I think we maintained it throughout the game, playing with five defencemen probably took its toll on us at the back half of the game as did having the type of lead that we did, but the response today and the level that our guys showed that they’re capable of playing at was a real positive for us. You want to see him have success. I thought he played really well today. He’s another guy that, once our team found its game. I thought he and Timashov and Mueller, that line in particular again, just played at a level that they haven’t been at all season, and they’ve been good for us for lots of the season. But the level of competitiveness that they had just how hard they played in executing against a team that doesn’t give you a lot of time or space, it was a real nice job by them and for Braccs to get a reward. No update other than he came back and tried it and ultimately, we just decided to hold him out the rest of the ways. I don’t have any sort of update as to what’s going to happen from here. The Toronto Marlies (8-7-2-2) host the Wilkes-Barre/Scranton (9-9-3-1) Penguins to kick off December homestand where they open the month with six straight games at Coca-Cola Coliseum. 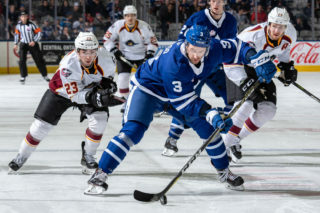 It’s the first meeting of the season between the two sides, but the Marlies will be excited to see some new faces after taking on the Cleveland Monsters in each of their last three games. 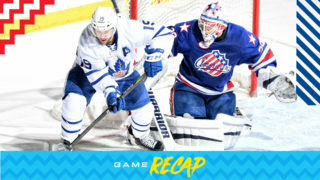 The Marlies come into play after an overtime victory in Cleveland on Wednesday and are 3-0-1-0 in their last four games. Chris Mueller had the OT winner for the Marlies on Wednesday and continues to sit tied with Calle Rosen for the team lead in points with 17 (9G, 8A). Calle Rosen also has 17 points on the year (2G, 15A) from the blueline. It’s back-to-back games for the Penguins who come to Toronto after a 1-0 loss in Rochester last night. Teddy Blueger is leading the offense at the other end alongside rookie Sam Lafferty as each have 15 points on the year. Another rookie, Anthony Angello, has lit the lamp seven times and leads WBS in that category.